Dunham, Quebec’s gelateria Steffanos will behosting a free wine-themed gelato and sorbet event on Aug. 30 to highlight the region’s celebrated wines and to draw attention to the owners’ ambitious crowdfunding campaign for their newest invention, the Congelato. Stéphane Boivin and current Concordia student Karen Côté, the owners, had to find an imaginative way to deal with a very specific problem. The Congelato was designed as a portable food display to keep food cool for long periods of time without electricity and came about when Côté was invited to a summer festival but couldn’t afford the expensive and bulky equipment necessary to keep gelato from melting. Seeing it as a challenge, Côté modelled a rough idea of compartmentalized ice packs using Play-Doh. The two soon saw that they were on to something. “Concordia’s been a big part of our success. Huge,” she said of the long and difficult process of finding the expertise and money to help make the Congelato a reality. Concordia’s Associate Dean of Academic and Student affairs George Kanaan and Principal director of Special initiatives Joe Capano were singled out in particular by Boivin for their dedication and help, as was Concordia’s Small Business Support Network that helped them with research and business plans. The prototype was unveiled at a Dragons’ Den audition at Concordia last year which was won due to Concordia’s support in the Love your Local Business contest. The final commercial version, which was created over the winter months with the help of a professional designer, will be unveiled at the event. Though presently destined for food, they’re already planning to take it in other directions. Now Steffanos is hoping to harness Concordia’s love for their creation into the critical momentum needed to make the Congelato marketable. Started barely two seasons ago by Côté and Boivin, Steffanos has won a host of awards starting with the Best Service Award at Quebec’s Entrepreneurship Awards and a first place at the Love your local Business contest organized by Quebec’s Community Economic Development and Employability Corporation (CEDEC). Most recently the pair learned that travel website Tripdvisor.ca has rated Steffanos the second best Quebec restaurant out of a list of almost 13,500 entrants. “It’s because when people come to Steffanos, they feel completely welcome, they feel loved, and every gelato and panini we make has love in it. They recognize that,” said the irrepressibly upbeat and energetic Boivin, who said many of her best customers come from hours away and often stay for hours more. The gelateria came about one sweltering summer as Boivin and Côté were working long shifts at their factory job. Exhausted by the repetitiveness of the conditions, they realized making boxes on an assembly line wasn’t what they wanted to do with their lives. “Stéphane came to me and said, ‘what do you think about opening up a gelateria?” recalled Boivin. His previous experience in marketing and Boivin’s history of entrepreneurship and a background in commerce and creative writing was enough to get them started. Soon they’d flipped a commercial property bought in Dunham into a gelato powerhouse, but it wasn’t without hard work and patience. They took a gelato-making class to start off and embarked on a year of busy research, fundraising, and some very judicious purchasing of second-hand equipment on Kijiji: a batch freezer, originally priced at $40,000, bought for $4,000; $6,000 displays purchased for half that; and a $30,000 espresso machine bought at $450, among others. Boivin said only one piece of equipment was bought new, and they did the renovations themselves whenever they could. 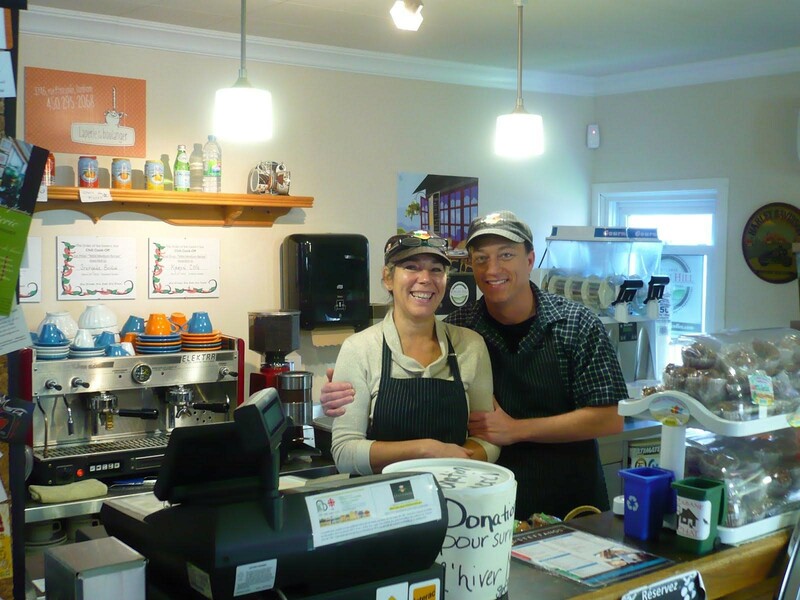 From the very beginning, their business found a ready clientele, with Côté making the gelato and handling communications and Boivin serving customers and taking care of business matters. “It’s not just the gelato; it’s the service, it’s the ambiance, it’s everything together and the whole package,” she said. Dunham is located in Quebec’s Brome-Missiquoi region straddling Quebec’s Wine Route and is known for its vineyards and grape varieties. It’s about 90 kilometers south-east of Montreal. Steffanos address is 143 Bruce Street, Dunham. The free wine-themed gelato and sorbet event will take place on Saturday, Aug. 30 from 11am to 6pm, rain or shine.